Oh, my gosh, life has just been crazy lately!!! I felt like I was barely keeping up before and then the holidays hit and my activity level really kicked into high gear. It's not been bad though, just much busier than I'm used to or ever intended to be. I try not to schedule too many things during this time of year because I want time to enjoy the season. This year though seems to have taken on a life of it's own. My interview and some of my art will be posted on their blog and Facebook page for the next week so if you get a chance please pop over there and give it a look. If you are a past customer on Daily Paintworks be sure to sign up for the giveaway. And while you're there remember that a gift of art (either mine or another artist) makes a wonderful and one of a kind gift for that special person in your life or as a treat for yourself! Gotta get back to work now! I still have commissions to finish and a Christmas card to design! Congratulations on your feature with Daily Paintworks! I have a squirrel that stops by everyday for a peanut. This painting is very well done and made me smile! Thanks Laura! These little critters certainly do have personalities! Glad I could put a smile on your face! It was such a beautiful painting! I am so totally jealous of the lucky winner! I actually found your blog through Daily Paintworks and totally love your artwork! 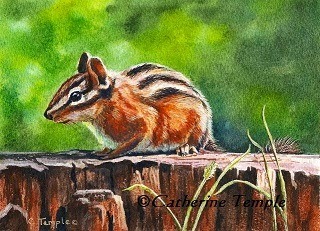 The critters in your paintings are almost alive... Amazing!